The Sardinia average temperature: May, June, July, August, September. 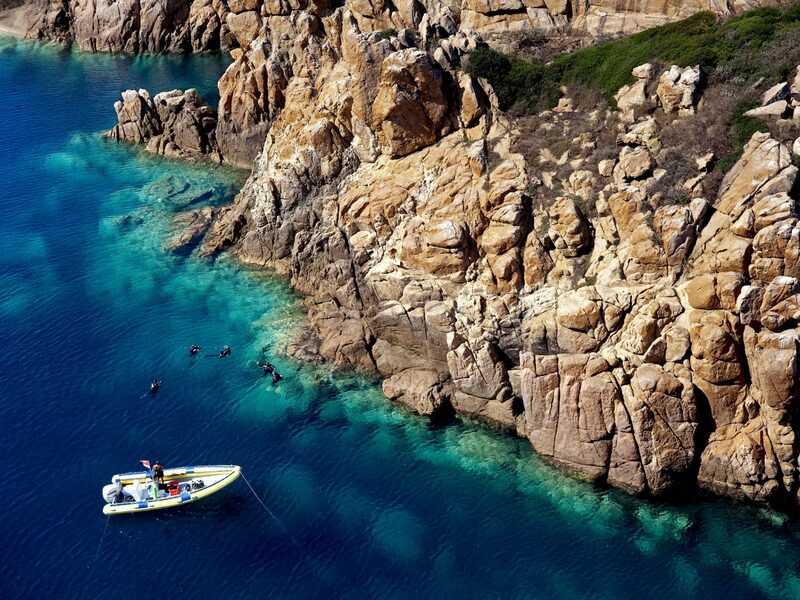 Sardinia is a beautiful island, known as the Caribbean of Europe. This island is rich in culture and history and offers unique natural landscapes. Sardinia is a destination for those who seek beautiful beaches with white sand and crystal clear sea. But it is also a highly demanded destination for nature lovers; in fact, national parks and marine protected areas offer a range of possibilities to explore the wildest and most authentic areas of the island: hiking, snorkelling, biking and diving are some of the activities that you can enjoy there. Now, when is the best time to go to Sardinia? The Sardinia average temperature usually is smooth throughout the year, even during the winter. 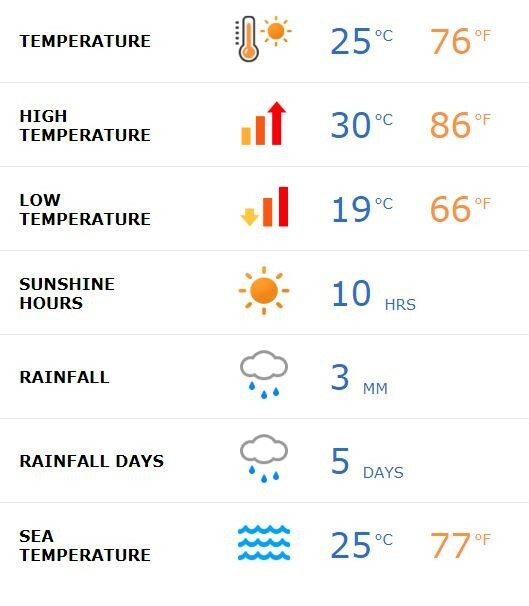 However, in this post, we will talk about the weather in Sardinia, in the most requested months, which are: May, June, July, August and September. The average temperature during May is 17 degrees; the maximum can reach 22 degrees during the afternoon and at night the temperature drops to 12 degrees, that’s quite good if you are thinking to enjoy Sardinia during May Bank Holiday. The average temperature throughout the day is 17 degrees so you can enjoy a day on the beach or a walk through the villages eating ice-cream. About the sunshine hours, you can enjoy 9 hours a day, only one less if May is compared to August. The sea temperature is enough to enjoy a nice swim on sunny days. May is also quite good regarding rainfalls. This month is not bad to enjoy a beach holidays, in fact, the month of May is calculated to only have 9 days of rain a month. This is a good excuse to travel in this month because you can enjoy a sunny and temperate days, but you will not find Sardinia as busy as it usually is. The average temperature during the month of June is 21 degrees. The maximum temperatures do not usually exceed 26 degrees and the minimum temperatures, which are usually at night, can go down to 16 degrees. Regarding rain, Sardinia is a destination where it does not rain much, 6 days of rain are estimated in the month of June. If you run into rain during your holiday don’t worry! It will be brief and very light (9mm). As for the condition of the water, the Mediterranean Sea has a temperature of 20 degrees, ideal for diving and swimming for hours. In the month of July, the average temperature rises a little, around 24 degrees. It is usually the sunniest month on the island and increases to 12 hours of sunshine a day. The temperature reaches its maximum in the afternoon, where it can reach 29 degrees. As for the minimum, it can get as low as 19 degrees during the night. The chances of rain decreases, compared to the previous month and 2mm of Rain is predicted. 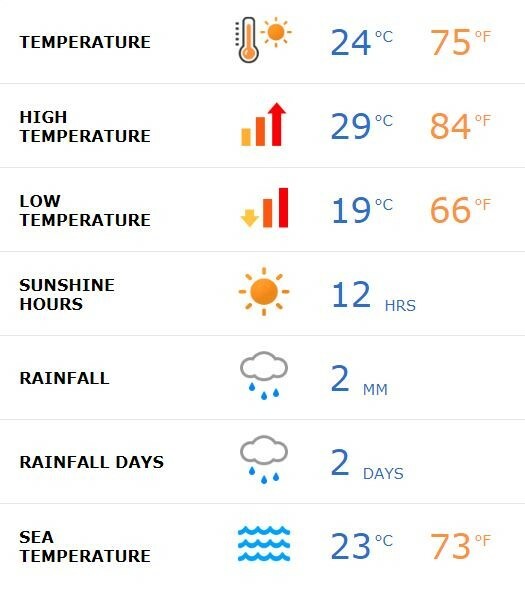 The probability of rain falls to two days, so we do not advise carrying umbrellas! As for the sea, its temperature rises slightly to 23 degrees, so it encourages you to spend all afternoon in it either diving or swimming. The month of August is considered the hottest month in all of Europe and Sardinia is not far behind. However, the island, due to its location and characteristics, offers protection from the torrid heat of the cities. 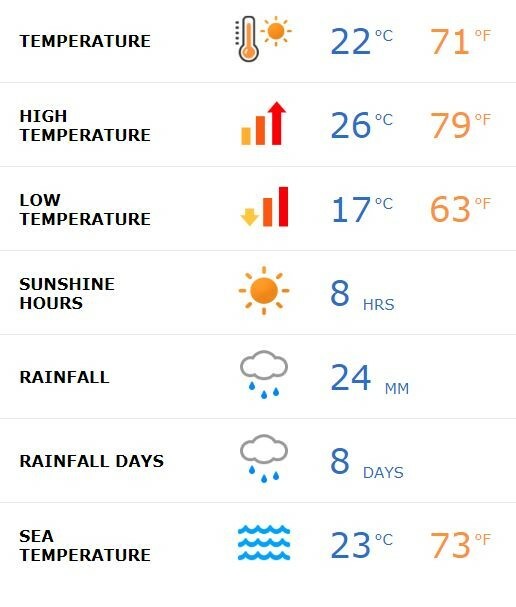 The average temperature during the day is around 25 degrees. The maximum can reach 30 degrees and is recorded mainly in the afternoon. As for the minimum, it drops to 19 degrees during the night. The days are a little shorter compared to July, around 10 hours a day, but the Rain is still scarce, about 3mm during the month that makes you forget the cloudy days. The sea temperature reaches its maximum of the year: 25 degrees. What makes bathing in the Mediterranean Sea irresistible! September is still a hot month in Sardinia, in fact many couples decide to take their holidays in this month because there is less influx of people. 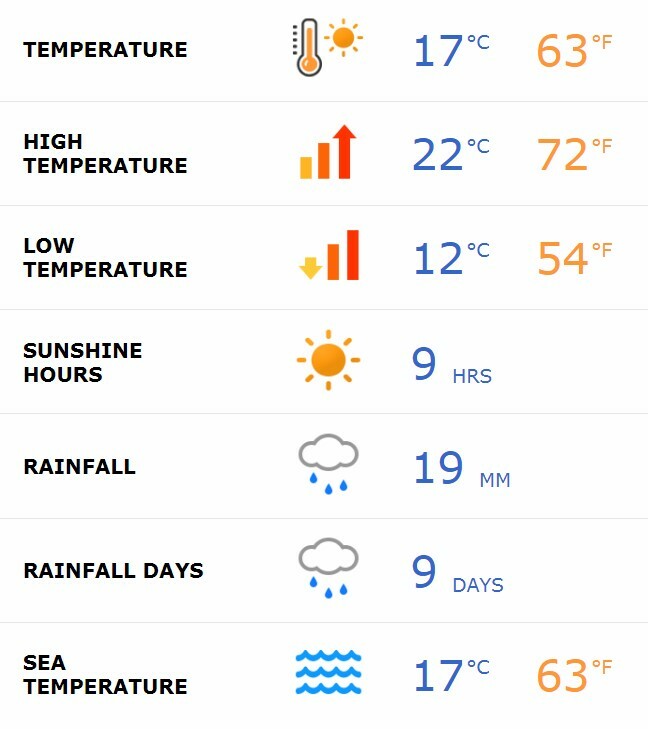 The average temperature is 22 degrees during the day; the temperature reaches its maximum in the afternoon and can reach 26 degrees. As for the minimum temperature, during the nights the temperature drops to 17 degrees so it is advisable to go prepared with some item of heavier clothing. The hours of sun go down to 8 hours and the probabilities increase to 8 days of rain per month (24mm). The sea temperature is maintained at 23 degrees, so spending hours soaking in the water is highly recommended. During these months we recommend that you wear high protection sunscreen to avoid unnecessary burns and to spend your time having an unforgettable vacation. Visit Sardatur Holidays to get the best deals for couples and families in one of the most beautiful islands of the Mediterranean. Or follow us on Instagram and Facebook and keep posted on the Italian holiday. Every year we offer our clients some offers in very advantageous holiday packages that you can visit here.